TOKYO (Reuters) – Japan’s chief cabinet secretary has signaled Tokyo’s readiness to intervene in the market if the yen spikes out of line with fundamentals and defended the Bank of Japan’s negative interest rate policy. Yoshihide Suga, one of premier Shinzo Abe’s closest aides, told Reuters in an interview on Tuesday the government will respond “appropriately” to unwelcome yen gains that hurt growth. He also stressed the need to respect the BOJ’s independence from political interference, a sign the government will not get in the way if the bank opts to deepen negative rates to stimulate the economy. Suga’s comments come as Japan struggles to get on a solid growth track. Its economy ground to a halt in April-June and analysts expect any rebound in the current quarter to be modest, as weak global growth and the yen’s 20 percent rise against the dollar this year have hurt exports and capital spending. He said yen moves were a key debate topic at a regular meeting he created that gathers senior officials from the Ministry of Finance, the Financial Services Agency and the BOJ. “Through the meetings, the government will closely watch market moves and respond appropriately,” the top government spokesman said, when asked whether Tokyo could intervene in the market if the yen spikes abruptly. 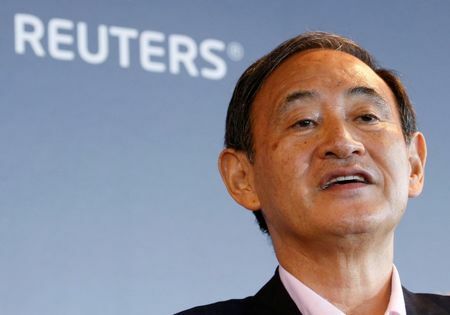 In a prepared speech later at a Reuters newsmaker event, Suga stressed the government’s resolve to respond “decisively” to excessive market moves. The comments suggest Tokyo is not letting its guard down against the risk of a renewed yen spike, even as recent hawkish messages from U.S. Federal Reserve officials push up the dollar to around 102 yen, off lows below 100 hit this month. Japanese officials have repeatedly threatened currency intervention to deal with their headache of a strong yen. But they have held off for fear of infuriating Washington, which has warned against intervention that could be seen as seeking to give Japanese companies an unfair competitive advantage. The BOJ’s decision in January to adopt negative interest rates has failed to arrest yen gains and drawn market criticism for hurting financial institutions’ profits. Under pressure from Abe’s administration, the BOJ eased last month by expanding purchases of exchange-traded funds (ETF). A majority of economists expect the bank to act again next month. Asked if the BOJ had room to cut rates further, Suga said negative rates and any other steps the BOJ takes would give financial institutions “huge” benefits if they boost the economy. On whether Japan could resort to “helicopter money”, or direct central bank underwriting of government debt, Suga said there was no clear definition of what helicopter meant. He added it was important for the government and the BOJ to work closely together to beat deflation. “The BOJ will conduct a review of its policies to achieve its 2 percent target. In any case, it’s important not to impair fiscal policy and the BOJ’s independence,” he said. In a case of coordination last month, the government announced a spending package shortly after the BOJ eased policy, Suga said. “I’m confident that we will see results if the government and the BOJ coordinate policies,” he said. Data released on Tuesday showed household spending remained stubbornly weak in July even as the jobless rate hit a 21-year low.